The most versatile baby sling available. It is usable in front, hip, back, reclining, nursing, and kangaroo carry positions. Additionally, it can be used as a harness, shopping cart strap, lightweight blanket and more. Very adjustable. The top and the bottom of the baby sling can be adjusted independently, allowing a perfectly customized fit. Fits both Mom and Dad. The long tail of our baby sling will allow large people to wear it. The lack of padding allows it to be tightened enough to fit small people. Three lengths are available. Choose a length which will allow Mom to cover herself when nursing. Perfect for nursing. 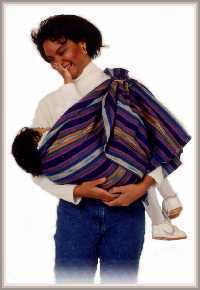 Mom can drape the tail of the MayaWrap Baby Sling over her shoulder for complete coverage. The Maya Wrap Baby Sling is very adjustable. In most cases it will fit both Mom and Dad. Petite users can make it as tight as they would like because it is not padded. The long tail also allows it to fit large users. The only difference between Sling sizes is the length. This means the only difference you will notice when wearing different size Maya Wrap Baby Slings is the length of the tail. A medium will work well for most people. If you are petite you may prefer the small so that you will have a shorter tail. If you are tall or large the tail might not be long enough to cover you when you nurse so you will prefer a large. If you are not breastfeeding you probably will not need a large. We currently only stock our slings in Medium. However, we are always willing to special order slings of different sizes and colours than what you see here. Please note that special orders will ship direct from the manufacturer in the USA. This is definitely on the "must-have " list whether this is your first or your fourth baby. It is literally one of those items that can change your whole outlook on being a mama. I ADORE my Maya Wrap. It is the single item that as a mama I could not do without. My Maya Wrap Baby Sling is freedom. It keeps me from those "it's just too hard to go out" feelings. It is so easy to shop with baby in tow. In fact, you will often see me traipsing through the aisles of Costco with Derry in the sling nursing away (though you may not notice he's nursing, because of the great cover! ), and both my hands free to push the cart and/or corral the other three wee ones. It keeps him snuggly close and happy. Never a fussy moment when he's slinging, he simply drifts off to sleep when he's tired, rocked by the rhythm of my body. It nurtures our connectedness, and you can't ask for too much more than that. And besides all of this, it is extraordinarily comfy too! There is so much more I could write, if you want to know more of why I love the Maya Wrap and recommend it to every new parent, just e-mail me! Carrying babies, and touching them constantly, stimulates brain growth. Babies who are not touched are seen to have brains up to 30% smaller than babies who are touched often. The easiest baby carrier to use. Simply slip it on and set your baby inside. There are no buckles or straps to adjust. Nothing could be simpler. The ultimate in hands free baby carrying. With the Maya Wrap Pouch Baby Carrier your baby is not strapped right next to your body. This allows the Pouch to pivot when you bend over so that you usually will not need to put an arm around your baby. below 30" 30-33" 34-37" 38-42" 40-45"
"Being touched and caressed, being massaged, is food for the infant; food as necessary as minerals, vitamins, and proteins. Deprived of this food, the name of which is love, babies would rather die. And often they do."